Soothing and luminescent soliloquies for flute. 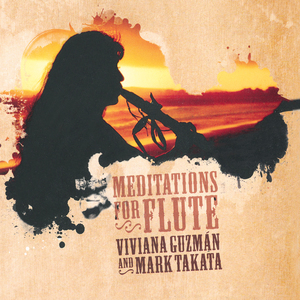 Flutists Viviana Guzman and Mark Takata join forces to present wonderful "Meditations for Flute" using an assortment of western (Guzman) and cedar flutes (Guzman and Takata). Echoing the valleys of the sweeping California coastline where the music was recorded, their free flowing improvisations soothe the spirit and nourish the soul. This album represents the evocative serenity of the acoustic flute with a simplicity that transcends time.